Sunday October 25th 1903 Will was obliged to go to the pasture in the morning. I was busy all forenoon. I read and wrote in afternoon. Mollie came back at dark. I talked with her all evening. 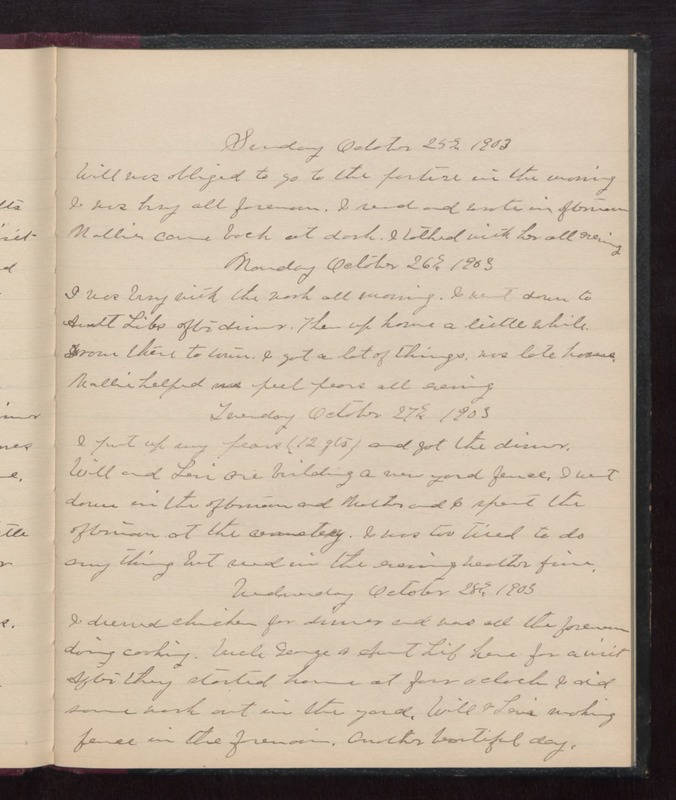 Monday October 26th 1903 I was busy with the work all morning. I went down to Aunt Libs after dinner. Then up home a little while. From there to town. I got a lot of things, was late home. Mollie helped me peel pears all evening. Tuesday October 27th 1903 I put up my pears (12 qts) and got the dinner. Will and Levi are building a new yard fence. I went down in the afternoon and Mother and I spent the afternoon at the cemetery. I was too tired to do any thing but read in the evening. weather fine. Wednesday October 28th 1903 I dressed chicken for dinner and was all the forenoon doing cooking. Uncle George & Aunt Lib here for a visit. After they started home at four oclock I did some work out in the yard. Will & Levi making fence in the forenoon. Another beautiful day.